In the homonymous 1981 bestseller ‘Getting To Yes’ is a synonym for reaching an agreement, either after a Deal-Making Negotiation or as the outcome of a Dispute Settlement one. The phantom thread between the two is that the very same contract being both a conflict solved and a source of conflict can itself provide the rules for its own conflict-solving, in a time when the parties’ disposition is not yet undermined by resentment or revenge. The more such rules are contextualised and tailored for the parties’ needs, the more settlement will prevail over litigation and the number of issues left to post-dispute negotiation will be reduced. 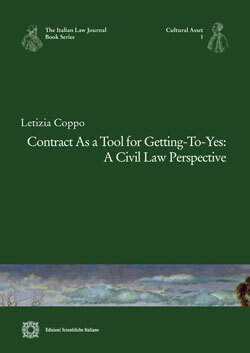 In this perspective, the purpose of the book is to identify the milestones of the ‘path to Yes’, on one hand by investigating the tormented relationship between contract-design and contemporary contracting, too often slave of standard forms, on the other hand by analysing the features of the most useful clauses widespread in international commercial practice and their compliance with the Italian system. Letizia Coppo is post-doctoral researcher and lecturer at the Law Department of the University of Torino; she is junior executive editor of the Italian Law Journal and she is the author of minor publications.